Herman Vandever is a very accomplished silversmith who works in a variety of styles, including overlay work and sandcasting. When using stones, he always uses superior natural stones. 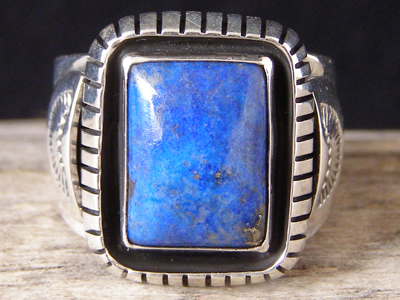 This is a fine man's ring set with a rectangle of natural, untreated Afghani lapis lazuli. The stone is set in a smooth bezel within a shadowbox formed by a beveled-edge saw and filework border. Nicely detailed with a fine stone. Hallmarked Herman V in script and stamped Sterling inside the shank. Ring face: 7/8" x 3/4"